I know the tea party has had some rallies where turnout was undersold, but whoever got mulitiple senators to come out and speak to this "crowd" should probably be fired. Despite featuring Tea Party icons Sens. Jim DeMint (R-SC), Mike Lee (R-UT), and Rand Paul (R-KY), among others, a gathering outside the Senate organized by the Tea Party Express to urge Republicans to stand firm against a compromise bill drew only a handful of attendees. 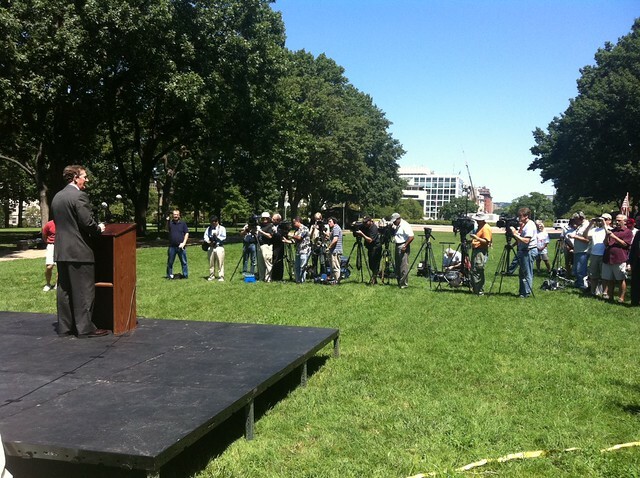 Reporters, many of whom came to interview presidential candidate Herman Cain, appeared to easily outnumber protesters. And despite being the most prominent attendee, Cain ended up not addressing the crowd and instead watching from the sidelines. "Thought experiment: If liberals pulled a few hundred people to Congress for a rally against cuts/for tax hikes, would they get this much coverage?" I'll answer that one for him. Moveon and others are having a rally today, and I bet there are more people (not like that will be difficult), and I doubt there's as much coverage. The tea party message ties perfectly to what the beltway media already believes (people angry about deficit, poor people have it too good, cuts to social security and medicare are necessary). The message from a group like moveon (people need jobs, austerity doesn't work and will hurt the economy, don't cut medicare and social security, rich people and corprations should have to pay their fair share of taxes too) just doesn't fit any of their narratives. They're ok with people being angry at the government, but only if it's for their pre-approved reasons. And as we've seen before, if something doesn't fit a cookie cutter beltway narrative, they just ignore it and pretend it doesn't exist.